I want to take this opportunity to wish you and your staff a happy holiday season from Dearborn Real Estate Education. Thank you for your continued partnership. We have enjoyed serving you and your students this past year. Be on the lookout for our 2015 catalog, releasing in early January. We are very excited for 2015 and look forward to working with you in years ahead. We offer an assortment of college-level textbooks to support your existing real estate curriculum or to incorporate into a new program. Realtor.com® looks ahead to the new year. With an accelerating economic recovery, 2015 looks good for both buyers and sellers. 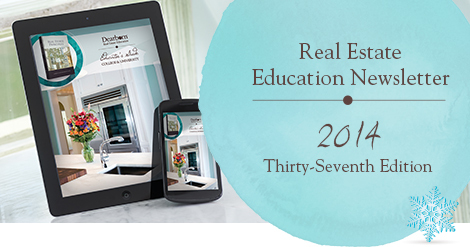 This message contains an advertisement for Dearborn Real Estate Education. Unsubscribe from future messages from Dearborn Real Estate Education. To ensure delivery to your inbox, add us to your safe list. ©2015 Dearborn. All Rights Reserved.